This past September, Take Five Café joined Big Brothers at the Big and Little Picnic at Confederation Park. They brought dozens of delicious cupcakes, a tub of electric blue icing and endless gummies, candies and sprinkles for an amazing cupcake decorating station for the kids. The purpose of their trip, however, was to collect entries from the Big and Little Brothers for The Take Five Café Mixologist Contest. 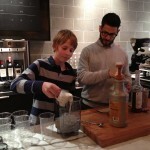 Big and Little Brothers were challenged to create a delicious drink using ingredients from a list provided by the café. 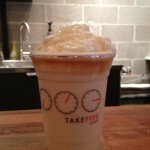 The winning drink would not only be featured in all Greater Vancouver Take Five Cafes, but the winning ‘Mixologists’ would also receive a $500 dollar give card to Best Buy! Not surprisingly, the ballot box was bursting with inventive and crazy recipes. After much deliberation the entries were narrowed down to the top five and were put to a vote on Facebook for the winner. All top five recipes were a creative and delicious use of the ingredients, but there was one clear winner with a whopping 405 Likes for their drink on Facebook. 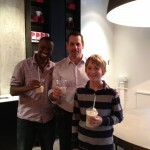 Matt is one lucky kid, not just because he won this amazing prize, but because he has Kosi for a Big Brother. Kosi described the best thing about being a Big Brother as “getting to do stuff thati haven’t done in a long time and,” he added as he high-fived Matt with a huge smile “having a really great best friend!” Matt and Kosi have been matched for one and a half years now and have an amazing time together playing video games, go-karting, and embarking on all kinds of adventures. The Vanilla Explosion Smoothie will be available at all Take Five Café locations across Greater Vancouver for the month of December. All proceeds from sales of the drink will go towards Big Brothers of Greater Vancouver’s mentoring programs for at-risk children in our community.